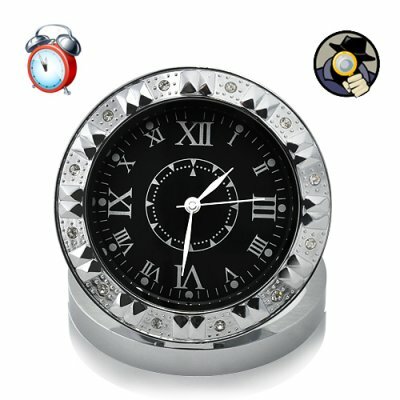 Successfully Added Undetectable HD Camera Clock with Motion Detection (4GB) to your Shopping Cart. No one will ever suspect they are being secretly recorded with this fully functioning table-clock. That’s because hidden within the 12 o’ clock time marker is a virtually undetectable high definition pinhole lens that discreetly captures HD video and audio to a micro-SD card. The I84 comes with motion-detection activated recording. This allows you to leave the device ON and automatically record only when there is movement in front of the lens. This is the best way to catch people snooping around your office, a burglar in the act or maybe even your partner cheating on you! Record beautiful high definition video at 1280x960 resolution and 30 FPS for smooth motion capture. Videos are recorded in user-friendly AVI files directly to the micro-SD card (free 4GB included). If you are looking for a device with outstanding video quality then the I84 is sure to satisfy. Place this clock on your nightstand, living room or office desk and come back the next day to review all the activity for the day. You may be surprised at what you find! With the high definition pinhole lens and solid yet fashionable design this clock is sure to be one of our top gadgets of the year. Order now and we’ll express ship your order out within 24 hours and even include our hassle free 12 month warranty. How does the motion detection work? Press and hold the function button located beside the mini USB port, after doing so, the red and yellow light will flash fir 6 times and then stop flashing, indicating that you are now in motion detection standby mode.